A graduate student at the University of Arizona College of Medicine – Phoenix has been awarded a scholarship for her work linking stress to anxiety and depression. 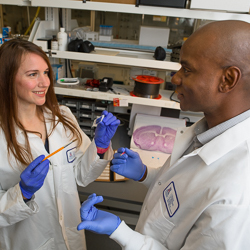 Tanessa Call, a graduate student in the laboratory of Deveroux Ferguson, PhD, was selected to receive the Harry Lowell Swift Advancing Health Care Scholarship. Call is working towards her PhD in neuroscience at Arizona State University. This scholarship is awarded to graduate students who are advancing health through biomedical or biotechnological research. Call’s interest in neuroscience and depression began in an undergraduate abnormal psychology course. Her first research experience was studying schizophrenia in the laboratory of Ron Hammer, PhD, a professor in the department of Basic Medical Sciences. She volunteered in Dr. Hammer’s lab for two years before joining Dr. Ferguson’s lab in 2014. Dr. Ferguson’s laboratory researches the effects of stress on the development of anxiety and depressive-like illnesses. They have discovered that a specific protein, sirtuin 1 (SIRT1), is elevated following a chronic social defeat stress model. This elevation occurs in a brain region called the nucleus accumbens, a major reward processing center in the brain. Interestingly, this protein is only increased in a subset of chronically stressed animals, dividing the groups into stress “susceptible” and stress “resilient.” Call’s thesis work aims to elucidate physiological and morphological changes that occur following the manipulation of SIRT1. Call said she hopes one day her research will lead to development of novel antidepressants, perhaps someday leading to the development of more personalized medicine for sufferers.